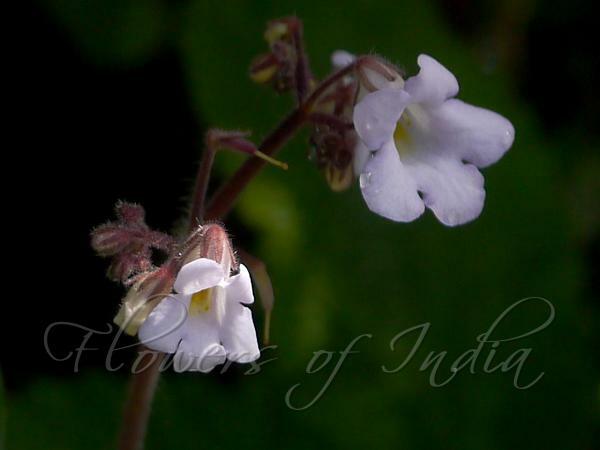 Meebold's Stone Flower is a herb growing on wet rocks in southern Western Ghats. Leaves are thin, in a basal rosette, older leaves with elongate stalks, winged and more or less lacerate, white-hairy especially on the nerves, younger and central leaves nearly stalkless, more woolly, softly rusty-hairy, stalks up to 13 cm long, narrowly winged, the wings scarcely lacerate; blades membranous, ovate, blunt at tip, narrowed at base, prominently toothed, up to 10 x 6 cm, lateral nerves 5-7 pairs, prominent beneath and branched. Flowers are pale blue with yellow tube, bracts small. Calyx is small, 5-fid or 5-partite, sepals narrow. Flowers are ventricose, 2 cm long, petals 5, rounded, flowering stem slender, up to 25 cm long in fruit. Stamens do not protrude out. Ovary is narrow, 1-celled, sessile or stipitate. Capsule up to 4 cm long, oblique, glabrous; seeds subtrigonous minutely pitted. 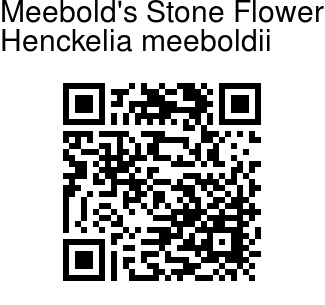 Meebold's Stone Flower is native to Southern Western Ghats. Flowering: October-December. Photographed along NH 49 near Chinnakanal, Munnar, Kerala.